Concours of Elegance 2017 will welcome a host of rare and important Aston Martins to Hampton Court Palace this September, tracing the history of the brand from the 1923 Aston Martin ‘Clover Leaf’ all the way through to the DBR9/01 racer. There will also be a special Aston Martin V8 display of more than 100 vehicles, including an example of each V8-engined model produced by the iconic British manufacturer. The 1923 Aston Martin Clover Leaf appears in the main concours event, earning its place among more than sixty of the most incredible cars in the world. It is thought to be the second-oldest roadgoing production Aston Martin in existence, and has recently been treated to an extensive restoration back to the special three-seat layout it was original built with. Also on display is a 1933 Aston Martin Le Mans Short Chassis, one of only around 130 examples built. Produced at a time when Aston Martin was investing heavily into the world of motorsport, this roadgoing version of a Le Mans 24 Hours class winner has earned a reputation as one of the most thrilling pre-war sports cars ever built. The more modern world of Aston Martin motorsport will also be showcased at Hampton Court Palace this September, with the DBR9/01. Built to take on the dominant Chevrolet Corvettes on the GT racing circuit, it was victorious over the American cars on its very first outing at the Sebring 12 Hours in 2005. Based loosely on the DB9 road car, the DBR9 features a 6.0-litre naturally aspirated V12 engine, producing around 600bhp. No Aston Martin display would be complete without examples of the legendary partnership between Aston Martin and Italian design house Zagato. 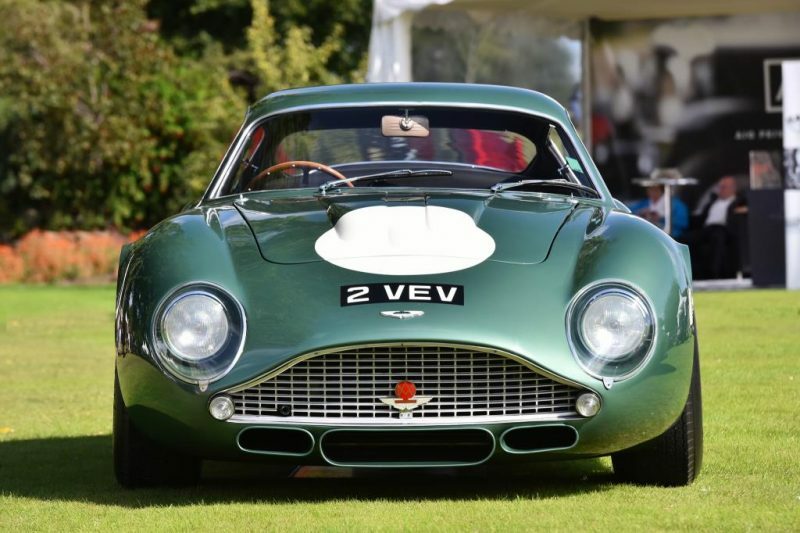 Perhaps their most beautiful creation, the DB4GT Zagato, will be on display in the grounds of Hampton Court Palace. This particular DB4GT Zagato, nearly 50kg lighter, 12hp more powerful and with a more aerodynamic shape than a standard DB4, was raced extensively in Australia, and with great success. It’s also extremely rare, with just 19 DB4GT variants built. Away from the main concours event is a gathering of more than 100 Aston Martins celebrating the brand’s V8-powered models. Beginning with the 1969 Aston Martin V8 and running through to the latest V8 Vantage, there will be one example of each V8-engined Aston Martin ever built. A new central stage will be the focal point of the Concours of Elegance this year, hosting moving displays of vehicles across the weekend, including the various Aston Martins. The Concours of Elegance takes place at Hampton Court Palace from the 1-3 September, with tickets starting from just £25 and concessions from £17.50. Children under five and carers can enter free of charge. Members of the public also have the opportunity to attend on Friday 1st September, a day normally reserved for the Owners of the main Concours cars.